Asinelli and Garisenda Towers in Bologna, Italy – The Asinelli (the taller tower) has a height of 92 m and overhang of 2.2 m, while the Garisenda (the smaller tower) has a height of 48 m and overhang of 3.2 m. The Asinelli tower was used as a prison back in 14th century and since then has been used in scientific experiments related to Earth’s gravitation, and served as a sight post in World War II. Pagoda at Chongsheng Temple in Yunnan, China – The Three Pagodas were all built between 850-950 AD in the form a symmetric triangle north of the ancient city of Dali. The tallest pagoda reaches a height of 69.1 m, but over 1,000 years of earthquakes below a weak foundation has caused the left pagoda to tilt. Today, the local government has taken great measures to strengthen the base and preserve these structures for years to come. The Crooked House in West Midlands, England – Originally built as a farmhouse in 1765, subsidence from local mining in the 1800s left one side of this building sitting four feet below the other side! Today the building serves as a restaurant/pub that offers some very intriguing optical illusions like glasses sliding across tables and marbles rolling uphill. The Leaning Tower of Suurhusen, Germany was, after some debate declared the most tilted tower in the world by the Guinness Book of World Records, with its steeple inclined at a head-tilting angle of 5.19 degrees. The church was built with foundations made from oak tree trunks, and when water was drained from the ground in the 19th century the trees rotted resulting in the Earth sinking underneath the tower. The Leaning Tower of Pisa, Italy – What list would be complete without the most famous leaning tower of them all, the Leaning Tower of Pisa? Thanks to Google’s ultra-high resolution of the area, you can look into the center of the tower from above and even see tourists gathering at the base of the tower. 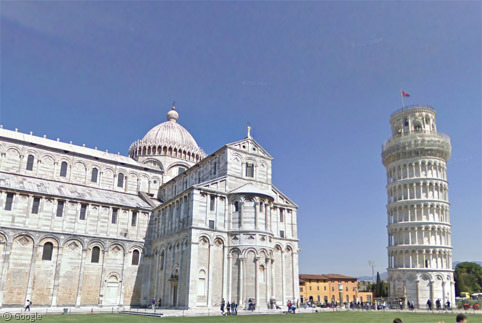 Unfortunately, the Street View car never really gets close enough to see the tower itself, but we have a great view of the perimeter wall that surrounds the Piazza dei Miracoli. For a list of leaning towers around the world, check out this Wikipedia article. I think i’ve got another one to submit : The St John’s church, in Caen (France). Wow that just looks like it’s going to bust under all that pressure! Good find! There’s a leaning house near where I live in Denton, TX that’s well-known, at least locally. Ha, I was just about to mention the one in Denton. Although it’s reason for leaning is a little contrived! This upside-down White House serves great pizza! Theres a wonky shop in Canterbury. The former kings school shop. So wonky it doesn’t make any sense.